The 2014-2015 contest is now closed. Click here to be taken to the 2015-2016 Young Patriots Essay Contest page. Or, read the winning essays from 2014-2015. The National Center for Policy Analysis and Debate Central are proud to announce the 2014-2015 Young Patriots Essay Contest! Entrants have the opportunity to compete for $10,000 in scholarship money. 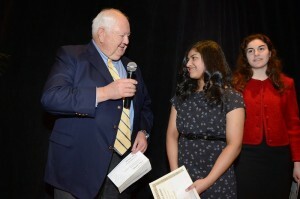 The Young Patriots Essay Contest is designed to challenge high school students to creatively solve problems in the realm of economics and public policy through the art of writing. We assign a controversial topic each year and only THREE winners are chosen out of hundreds of essay submissions. Find the topic and entry instructions below the fold! Last year’s contest winners receiving their awards in Dallas. You may also incorporate outside research into your writing. Although this is not required, it may improve the overall quality of your essay. Your essay should be written in English and should not exceed 1,200 words. For more guidelines on submission and formatting of entries, see below. All essays must be submitted by Monday, January 5 2015 at 11:00pm CT. No late submissions will be accepted. Submit your completed essay via email to Rachel.Stevens [at] ncpa.org. Be sure to include your name, address, phone number(s), and email address in the body of the essay document. Your personal information does not count towards your total word count. UPDATE: The 2014-2015 contest is open to middle school students, as well as high school students. Please disregard any conflicting information. Have your winning entry be sent to your hometown newspapers, radio and TV. Q. How should I format my entry? A. Essays should be written in English, with submissions of up to 1,200 words. Essays exceeding this length will not be considered. Please submit your entry as a Microsoft Word document. Also be sure to include all essential information, including your name, address, phone number(s) and e-mail address in the body of the essay. This information does not count against your total word count. Q. How do I submit my entry? E-mail your submission to Rachel.Stevens [at] ncpa.org. Each e-mail submission will receive a return message verifying that the essay was received. Q. What happens if I exceed the word limit? A. Your essay will not be considered. There is no word minimum. Q. Who is eligible to enter? A. Any current middle or high school student or recent graduate who has never enrolled as a degree-seeking student in any college/university. If you have enrolled in a college course for dual credit with your high school, you are still eligible. Q. Are homeschool students eligible? Q. Are international students eligible? A. Yes, as long as they meet the criteria above and write the essay in English. Q. How can I spend the scholarship money? A. For tuition or related expenses at a college or university of your choice. You are NOT allowed to spend the money on non-educational expenses. Q. Can I choose to remain anonymous? A. No. We must be able to publish both your essay and name. Q. How should I format citations? Goodman, John. What is Wrong with the Drug Industry? John Goodman’s Health Policy Blog. National Center for Policy Analysis, 23 Sept. 2011. Web. 24 Sep. 2011. ‹http://healthblog.ncpathinktank.org/whats-wrong-with-the-drug-industry/›. For additional citation questions please consult Purdue University’s free online formatting and style guide. The works cited page should not be included in your overall word count. Q. Do I need to attach a cover letter? A. No, but make sure you include your name, address, phone number(s) and e-mail address in the body of the e-mail. Q. Is there anything else you can tell me about how to stand out from the crowd? Stick to the subject and topic. Submitting your essay in the proper format is essential, but the substance of your essay is the most important part. If you write a fantastic essay that doesn’t address the central question you won’t win. Submit a professional document. Double check grammar and spelling and try to make rambling sentences more concise. Follow and demonstrate a clear vision. This contest leaves lots of room to address the subject in a variety of ways. Students should attempt to be creative, clear and persuasive in their approach to the topic. Include your perspective on the works. Show us that you have read and considered the material. Do not simply summarize the readings but rather explain how they influence your thinking on policy. Q. Do I need to agree with the authors? The short answer: No. The longer answer: No, but you should warrant your disagreement with outside sources and research. Make sure your argument is complete, articulate and supported. Avoid ad hominem attacks that indict the author without properly considering the merit of the argument. Q. Is there just one prize? A. No. First, second and third prizes will be awarded in the amounts of $5,000, $3,000, and $2,000 respectively. Q. I sent you an email and haven’t heard back. What is the problem? A. Most likely nothing. Our offices are closed periodically in late December and early January for the holidays. If your message was sent during this time, you should have received an automatically generated reply. Check your spam folder. If you did not receive any sort of reply, please try re-sending the message. If that fails, leave a time-stamped comment here and we will get back to you ASAP. PRIVACY: This scholarship is funded by the National Center for Policy Analysis, a 501(c)(3) nonprofit public policy organization. Any personal information collected from non-winning entries is used only in aggregate to gauge participation statistics. Contest winners must agree to have their name, school, grade level, home town, and essay made public for site usage, NCPA newsletter, etc. Beyond the initial confirmation email, contest entry will not result in any further communication or solicitation from Debate Central or the NCPA. We will never sell or otherwise distribute your personal information to third parties. Any questions? Leave them in the comments. We’ll get back to you right away. who is eligible to compete in this contest? All high school and middle school students are eligible to compete. If you are a high school student at the time of the January 5 deadline, you’re eligible. Recent high school graduates who have not yet enrolled in any college or university (AP or dual credit are ok) are also eligible. Thanks for your interest; we hope you’ll choose to enter! Can we submit the application through google docs? Are US citizens located and graduation from high schools outside the USA allowed to enter? Non-US high school students are eligible to compete. Thanks for your question, and good luck! what is the due date? All essays are due January 5, 2015. Good luck! Although we wish you luck, since you have an associate’s degree, you are not eligible. if your a college student are u eligible to compete in this competition? College students are not eligible for the award. We hope you’ll stay up to date with the NCPA, though! Check out our paid internship program here! When do you announce the readings for next year. This looks like a summer reading and writing activity I could be passionate about. BUT I am taking 4 college classes and am involved in all kinds of volunteer and competition activities and do not have room for more reading. When does this go live for 2015? Like to plan for this. Good suggestion! We usually announce the prompt in August but can certainly look at releasing the contest earlier in the future. We’re sorry if you feel that you don’t have enough time to complete the contest this year! We’d still like to see you enter, however — you have a few months to work on the topic and we’d be happy to answer questions if you have them. also, i am from pakistan- in highschool, im eligible right? You are eligible. You are allowed to do outside research if you like, but it is not required. Good luck! also, i am from pakistan- should i refer & answer to this question with a general political/economic scenario of the world or in some country particular. That is up to you – it’s your essay! Just explain the reasons for your choice. Good luck! Hi, I am currently working on this essay. Can I choose a policy not mentioned in the articles and support my choice by facts from the articles. Feel free to write about any specific policy you like – the articles are meant to inform your point of view. Your essay is your own! Thanks, and we look forward to reading your submission! Hello, I am a high school student who plans on applying to this scholarship contest. Out of curiosity, how many people are expected to apply to this scholarship? Thank you. So glad you’re going to apply! Although the number of applicants varies by year, we usually receive several hundred. We look forward to reading your work! Hello i am edaso from Ethiopia. I am just intending to be part of this competition.what i want you to know about me is that i am currently learrning in one university of my country;just a second year student.so am i eligible to move on? Thank you in advance. Thank you for your interest! Unfortunately, university students are not eligible. We hope you’ll continue to check back for other opportunities more tailored to your age group. Hello, 2nd time poster. I applied to this scholarship, yet, I didn’t receive the promised email confirming my application. I was wondering why I haven’t received the email. Thank you. If you didn’t receive a confirmation, it’s possible we did not receive your submission. To ensure we did, please re-send. So sorry for the inconvenience! I sent it again. Let me know if you receive my email. I will also look for the confirmation email within the next couple of days. Im a Zimbabwean High School student in Zimbabwe. If I win, can i use the scholarship money here at a Zimbabwean University? And what happens if im on another scholarship? Also when are the winners announced? Is this a kind of scholarship that if you win, you can only use to one specific school? Or can you use it to whatever school you want??? The scholarship can be applied to any school of your choosing, as long as it is a college or university. Thanks, and good luck! Where do I write this Essay? Please submit it as an attached Word document to Rachel.stevens@ncpa.org. Good luck! Great hammer of Thor, that is polrufewly helpful! Does the works cited count towards the world limit? I would assume we have to properly cite the required readings in mla format. No, works cited does not count toward the word limit. Good luck! Works Cited does not count toward your word count. Good luck! In the caribbean we do CXC, i am currently doing it homeschooled and would be taking the examination in january, HOWEVER, i am not technically enrolled in a HS again but i am doing the normal exam with everyone else…Can i still enter? If you are homeschooled but will be working at a high school level at the time the essay is due, you are eligible. I’m currently a policy debater in Massachusetts debating the current resolution (Latin American Economic Engagement). Is it permissible to use current Affirmatives and cards on the topic as part of this essay as both the subject and evidence (like using the example of the Cuba Aff which lifts the embargo on Cuba which will lead to economic prosperity)? You can use whichever policy example you like, but the most relevant criterion is that you demonstrate that you both read and understood the supplied readings. You also will want to format your essay in MLA, not as debate evidence. Thanks, and good luck! Does the works cited page count as part of the word count? No, there is no need to include the works cited page in your word count. Thanks for your question! Would it be prefered if the bibliography is annotated? Annotation is not necessary. Just use MLA formatting and include a Works Cited page. Thanks for your question! I completed my high school this May, but could not yet join a college, so will I be eligible for this scholarship ? Yes, you are eligible. All students who have not yet entered college are eligible. Thanks for the question! Are we supposed to cite the four required articles that we are supplied? If so, how do we do that? Please cite the required articles where you reference them directly. Follow normal academic integrity guidelines, and use MLA formatting. Thanks for your question! Hello and thank you for the contest. For what purposes can the scholarship money be used, if won? I ask because I am looking at this for my daughter, who already likely has a scholarship that will cover tuition, fees, and books. Could this be used for other needed materials, housing expenses, etc? There are no restrictions on how the money is used. Thanks for the question! Hello! Am I eligible if I’m currently in high school, and taking college courses at the same time? If you are still a high school student taking classes for dual credit, then you are eligible for the contest. Thanks for your question! I was wondering to what colleges is this scholarship good for? Do we have to apply for this scholarship or do we simply submit the essay in time before the deadline and acquire it? Thank you for your time!! The scholarship is good for use at any college of your choice. You can also use it for books or other expenses. In order to apply, simply submit the essay along with your name and contact information. We will get in touch with the winners, once they are selected. Thanks for your question! Where exactly on the Debate Central Website is the section to see the essay topic and where to submit it. How long should the essay be? Essays should not exceed 1,200 words. Thanks for your question! Hello! I am a high school student here in the Philippines. I am not a US citizen, and I am not part of the K-12 curriculum (we only have ten years here). Am I still eligible to join? THANKS A MILLION! Hi Cedric, you are eligible to apply if you have not yet enrolled in any college, and plan to within the next year. Thanks for your question! Does the 1200 essay word limit include the name, date, email, or citations? Thanks. No, the word count does not need to include name/date/email or your citations page. Thanks for your question! Do you want the majority of the essay to contain explanations of the articles and the policy thinking that they suggest, or would you prefer for the majority of the essay to talk about our views on policy as pertaining to the question? Thanks for your question! How exactly you write the essay is up to you. Generally, we would like you to focus on how the readings inform your views on public policy. It is not essential that you agree with all of the readings, but it is important to engage them. I hope this helps. Hello, I was just wondering if it is too late to submit my essay. and are high school Sophomores eligible? It is not too late! The deadline is January 5. The sources seem to be vastly theoretical, so I am confused as to how we are supposed to be supplying specific “policy changes”. Are the sources merely an intellectual stimulation from which we must creatively develop our own personal opinion? Also, may I use other sources? Thanks for your question! Yes, you should engage the sources in a discussion of your own opinions on government policy. You are also certainly welcome to cite any outside sources you like. I am a highschool sophomore, and I will not be entering college until the fall of 2016. Would I be eligible to enter this contest this year and use the scholarship in 2016? The scholarship is good for one year, so you may want to wait until your senior year to apply. Thanks for your question! I am a sophomore, and beginning Running Start (program whereby starting in the junior year, WA students can attend a community college for high school credit) in September 2014. I am homeschooled, so I can only take two college courses under the program. If I win, can I use the scholarship to pay for more college courses? If you have not yet completed high school, but are taking college classes for dual credit with the goal of eventually obtaining a degree, that is an acceptable use of the scholarship money. It sounds like that is the case with you, so you would be eligible. We look forward to receiving your entry! Thanks! I submitted yesterday afternoon. When I didn’t get a confirmation email, I sent it again around 7pm. We’re in the west coast, though, so I’m not so sure about the time difference. I hope you got my essay. Thanks again. Our offices closed for a while for New Years, which delayed confirmation emails for some. I assume you have received a confirmation email by now. If you haven’t, you essay was not received. Please send it again immediately, and we will still consider it. Do we need to cite the articles that are given in the prompt in a works cited page or can we just reference them in the paper? Please include a works cited page. Thanks for your question! Is there an expiration date on the scholarship if I win? Because I am a junior in high school and I want to apply, but I know some scholarships are only valid for one year. So should I wait until next year when I’m a senior? Yes, the scholarship is to be used within a year. So, you may want to wait until next year to apply. Thanks! Do we mail our submission in or do we submit it online? How should the essay be included in the email? Should the email itself be the essay, or may I attach it as a document? Thanks. Either way is perfectly fine. Thanks for the question. Hello! Is there any prior registration process we have to do before we submit our essays? Oh, furthermore, I’m in a high school/college combo program called U3 Engagement. Am I still eligible for this scholarship? You are eligible as long as you are taking dual credit. If you were enrolled in a college alone, you would not be eligible. Oh, oh. First: reading your rneposse to My Name is Red brought the book, and my own experience fo reading it, back so clearly that the only way *I* can respond is to read it again. Because that is what you have made me want to do. I loved My Name is Red; it’s my favorite of all of Pamuk’s wonderful books, each special in their own way, but this one perhaps because I love Persian miniatures, perhaps because I was close friends, at the time, with a woman from Shiraz who enlarged the stories for me and made them even more real, perhaps because I too was a calligrapher at one time was a love affair in the reading, and like a love affair has left its fragrance in my life.But I also appreciate what you’ve done here and said, the way you’ve constructed this post and spoken of your own memories. What greater tribute to a writer’s work, or to that deeply personal experience of reading and falling into a book that we realize will hold us, somehow, forever? Are home schooled students eligible? A home school student is still considered “enrolled” in high school until they graduate. Yes, absolutely! Home school students are certainly eligible. I’m starting a blog soon but have no coding knowledge so I wanted to get advice from someone with experience. I submitted my entry a couple of months ago. When I submitted my entry, I was told to submit it to a different email than the one above (it was lauren.sabino@ncpa.org). Anyway, if I don’t submit it to the new email, will my essay be lost/not counted? Also, when the winners are selected, will they be directly notified? Yes, there has been a staffing change in the organization. Although I believe all of the entries have survived the transition, it might not be a bad idea to resend it, just in case. Winners will be directly notified once selected. Can this money be used for going to debate camp? No, the money is to be used for college. However, it doesn’t have to be tuition (it can be books, housing, etc). I hope that helps! Hello, I am a high school sophomore and I was planning on dual enrolling in community college next year. Would I be able to use this scholarship for that, or am I only allowed to use it on a 4 year college? As long as you are using the money to enroll in a college, that should be acceptable. We look forward to receiving your entry! When is the winner announced? Winners will be notified by the beginning of February. Thanks for your question! Roughly how many people entered the contest last year? Last year we had around 300 entries. Thanks for your question! Do we have to engage all four articles, or is it sufficient to engage two or three of them? Do whatever you believe crafts the strongest essay, but I would advise you to at least consider the perspective of all 4 articles, even if you do not directly reference them. Thanks for your question! Since nobody has mentioned it, I thought I should make sure: does the essay have to be in 3rd person, or is it acceptable to use 1st? Write the essay however you believe reflects the strongest representation of your writing abilities. There is no “rule” against 1st person for the contest. Thanks for your question. Oh, and when will the winners be notified? Thanks again. The winners will be notified by the beginning of February. Can you please provide an address that I can mail my essay to. Our computer will not e-mail it to your e-mail address at all. If you include a note referencing this comment in the envelope, I will accept the entry even if it arrives past the due date, provided the postdate is on or before 1/5. Thanks! I am a junior in H.S. therefore I will enter a university until fall of 2015, but can I still apply? When does the scholarship expire? Can I save the money until I enter college? Yes, you are eligible to enter. We look forward to receiving your entry! Hello Ms. Stevens! I just wanted to ask, are we allowed to supplement our arguments with a touch of personal tone (in the form of anecdotes regarding personal experiences with the economy, etc.) or would the judges be in favor of a strictly formal approach to it with no personal pronouns? Hi Daniel. You can include personal anecdotes if you believe they serve to improve your essay. There is no specific preferences regarding this; judging is based on overall writing quality and argumentative strength. I hope that helps! Thanks for your question. I know it’s still way too early, but when will students be notified of the results? Thanks! We’ll be notifying the winners by the end of the month. Thanks for your question! I have read your blog and really like the content, keep up the posts as I will be back. Your attitude I have found is insightful annd instructive. you’ve got here. I will be coming back to your site ffor more soon. Hi i was just wondering when the application to apply for 2014-2015 will be open? We will be launching the 2014-2015 contest soon. If you would like to get started early, this year’s topic will be similar to last year’s, so familiarizing yourself with the readings and beginning to think about the relationship between individual freedom and social prosperity would be a good idea. This is probably a weird question, but are multiple submissions allowed? Sure. If you would like to submit multiple submissions, we will consider them. That said, 1 great essay is obviously better than 2 mediocre essays, so spend your time wisely! Will the winners have to read their eassay if they win? No. The essay will be published on this website and the NCPA’s newsletter, but you will not have to read it out loud. Hi Cheyenne, this page has all of the application instructions. There is no form to submit, you simply email your completed essays to me. Can u apply for it if we are in 9th grade? Yes, any student 9th-12th grade is eligible. If we use outside sources should we include in text citations? Please use the Modern Language Association (MLA) format. Citations should be listed in a ‘Works Cited’ page at the end of the document. If for example I won. Do,I have to talk in front of the crowd?? I’m really a shy person. If so, any tips? and what should I say?? This is the current contest page for 2014-2015. Hi Ellen, you should incorporate the reading, as well as any outside research you feel is appropriate. You are not required to use outside information, but it may improve the overall quality of your essay. I’m a post graduate.I have done my master in 2008 .can I eligible for it ?and also I’m living in Karachi Pakistan can I participate in this essay contestand and also tell me about the age of the participants in this contest.what is the last date of submission of essay. Unfortunately, post-graduates are not eligible to enter. The contest is only open to high school students. Actually, I live in Ecuador, Can I participate in this contest? Hi Nicole, as long as you are a current high school student, you are eligible. High school students from any nation are welcome to enter! Hi Gabe, the winners will be announced in Mid-January 2015. Hi, if someone won the contest, but was not able to attend the award ceremony what would happen? Hi Kaylene- That has actually happened in the past, and it is not a problem. Of course we would prefer you attend, but if you are unable to, we will mail your award. Hello. I found this essay scholarship on Scholarships.com and it states that there are four readings, but there are only two links on this website. So I was wondering if we need to use those four readings or just the two listed. Thank you. Hi Elena- That must be a mistake left over from last year, when there was 4 readings. This year, there are only 2. You only need to worry about the readings linked on this page. I apologize for the confusion. Does the works cited page count toward the word limit? Hi Jocelyn- No, only the actual body of the essay counts towards the word limit. Hello, I am from Colombia and I graduated from high school on December, 2013. Since then I have been studying English and have not taken any university courses. Also, I have applied to study in the U.S. for Fall 2015. Am I elegible for this scholarship? Yes, if you have graduated from high school within the past year and have never enrolled in any university courses you would be eligible for the contest. You may want to post 2014’s Q&As first – on top of 2013’s. Do we need parenthetical citations? Also, there is some information I know but don’t know if others do. Does that call for a citation on the works cited page? Thanks in advance. Hi Denver, please use MLA citation formatting. That includes parentheticals. Use your judgment in terms of when you need citations– we will have the same expectations teachers would when writing an essay for school. Sir, I am pursuing B.A. in English. Am I eligible? Unfortunately no. Current college students are not eligible. What if I don’t have Microsoft word? Hi Christian, if you do not have MS Word, a number of free mirror programs are available for download online. Open Office is one such option, but there are many others. You may also submit your essay via Google Docs, as long as it is sent to Rachel [dot] Stevens [at] NCPA.org. You could also write your essay from a school or public library. hey, i am from Pakistan, and not any of the western nations. am i still eligible? Yes, students from any nation are eligible, as long as you meet the other requirements. Are non permanent residents ( non us-citizens ) eligible ? I meant to say permanent residents. Sir my brother is 20 years old. But due to some illness he is not enrolled in any university. Is he eligible? How many people have entered the contest in the past? Usually we end with somewhere in the neighborhood of 200-300 entries. I am from Venezuela. I want participate. The english level that I know is basic. Am I elegible? Hi, I am from Venezuela. The level of English that I know is basic and I want participate. Am I elegible? Yes, you are, as long as you are not currently a university student. May I write my essay in first person? Or must it be in third person? If I am from Colombia and won the contest, could I use the money from enrollment in a Colombian University? How would you be able to check my use of the scholarship? Winners are allowed to use the money towards a university outside the US, yes. Is there certificATES for participants? What date is the awards ceremony? It will most likely be held on February 4, 2015. That date is subject to change. Winners are not required to attend the event in order to receive their award, but of course we would love to see everyone here in Dallas! Are we also expected to cite the two required articles in our Works Cited page? If so, I’m having trouble finding the journal or program in which they were published. For example, in the example you have Goodman’s article on the drug industry as John Goodman’s Health Policy Blog. I’m not sure which blog/journal his other article was published in, as well as Landsburg’s article. It is not necessary to include the required articles in the Works Cited page, although students who choose to will not be penalized for including them. It makes no difference towards their evaluation. (This may have posted twice, sorry about that if it did) Also, are we allowed to address just economic or social prosperity, but not both? The slash between the two seems to indicate to me that that is possible but just making sure. That would be fine, Laura. Just make sure your essay presents a well-supported argument. Yes, as long as you meet the other entry requirements. So since I’m a junior, if I won the scholarship I just wouldn’t be able to use it in 2016 when I go to college? Because in earlier comments it said that it’s only valid for one year. If that’s the case, why are people from grades 8 – 12 able to apply? Any information saying it’s only valid for one year is outdated. Any middle or high school student is eligible, as long as they use the money for educational expenses upon entering college. If you are a junior, you can certainly use the scholarship in 2016. Sorry for the confusion! That’s good to hear. Thanks for your help! Hi, me again. I was wondering when we will find out who the winners are? Thank you in advance for your reply! One more question – do in-text citations count for the total word count? is the title part of the word count? Just a timestampted comment notifying you that I have submitted my essay. I received a confirmation email, this is just in case anything goes awry in the meantime. Do parenthetical citations count towards the word count? Must applicants also include in-text citations in addition to the bibliography? I am a student in an early college high school. Instead of going to high school for four years we go for five and earn an Associate’s degree. Would I still be eligible for the scholarship? When will results be announced? should essay be submitted exactly at 11:pm? Does the Work Cited Page count towards our word count? Never mind, I found the answer in the above comments. Just out of curiosity, when are the winners chosen/announced? Sorry, you’ve already answered this question above. Thanks! It says that the email format is incorrect and wont let me send it…so who do I contact? Hi, I have attempted to submit my entry twice now via email and have not received a conformation email in return. I didn’t get a confirmation email. Is something wrong? I didn’t get a reply email about my submission that I sent in yesterday? Is this normal? If I submitted my essay Sunday and have not gotten a confirmation email, should I be concerned? I submitted my essay by e-mail on Sunday, January 4th and have not received a confirmation e-mail. Has something gone wrong with my submission? I submitted my entry before the deadline, but I have not received a confirmation email yet. It may be because the internet is a little slow in my country, but does this count against the deadline? I sent in my entry on Saturday, but I didn’t get any sort of auto-reply at all. I re-sent it on Sunday just in case, but I still have not received any sort of auto-reply confirmation from you guys. What can I do? I just realized I submitted as a PDF instead of a Microsoft Word document. Can I send it to you again to be considered? above it says winners’ll be announced mid-january. is that still true?? I emailed my essay submission on January 2, 2015 and re-forwarded the email on January 16, 2015… However, I have not received any confirmation emails. Can you kindly check and confirm the receipt of my submission? do I have to have my ID in order to participate in essays? I was wondering when we could expect to hear back from you. I saw above that it says mid-January or end of January. If I haven’t heard back should I assume I didn’t make it to the final three? Wow, there must have been a lot of entries… I can’t find any results yet, and January has come and gone. I’m glad so many of us young people are interested in such an important topic! I all the time emailed thiis weblog post page to all my associates, because if like to read itt next my contacts will too. So I was wondering what format to type the essay in whether it be MLA format or some other format I do not know, but if you could give me an answer that would be much appreciated. Does the work cited page count in the word count? writers and use a little something from other websites. Have the winners been notified of the awards yet? Copyright © 2011 National Center for Policy Analysis. All rights reserved.